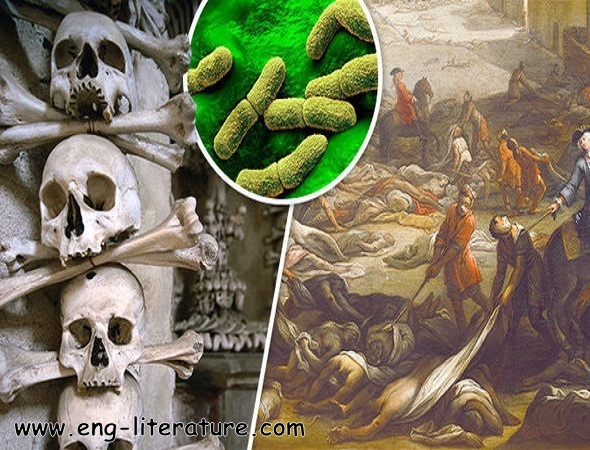 The Black Death is the name given to a deadly plague (often called bubonic plague, but is more likely to be pneumonic plague) which was rampant during the Fourteenth Century. It is a bacteria-borne disease; the bacteria in question being Yersinia pestis, which was carried in the blood of wild black rats and the fleas that lived off the rats. It was believed to have arrived from Asia in late 1348 and caused more than one epidemic in that century – though its impact on English society from 1348 to 1350 was terrible. No medical knowledge existed in Medieval England to cope with the disease. By Spring 1349 the Black Death had killed six out of every ten Londoners. One of the worst aspects of the disease to the medieval Christian mind is that people died without last rites and without having a chance to confess their sins. Lack of medical knowledge meant that people tried anything to help them escape the disease. One of the more extreme was the flagellants. These people wanted to show their love of God by whipping themselves, hoping that God would forgive them their sins and that they would be spared the Black Death. With the population so low, there were not enough workers to work the land. As a result, wages and prices rose. The Ordinances of Labourers (1349) tried to legislate a return to pre-plague wage levels, but the overwhelming shortage of labourers meant that wages continued to rise. Landowners offered extras such as food, drink, and extra benefits to lure labourers. The standard of living for labourers rose accordingly. The nature of the economy changed to meet the changing social conditions. Land that had once been farmed was now given over to pasture, which was much less labour-intensive. This helped boost the cloth and woollen industry. To curb peasants roaming around the countryside looking for better pay, the government introduced the Statute of Labourers in 1351. This created great anger amongst the peasants which was to boil over in 1381 with the Peasants Revolt. Hence, it can be argued that the Black Death was to lead to the Peasants Revolt.